February 16, 2013. 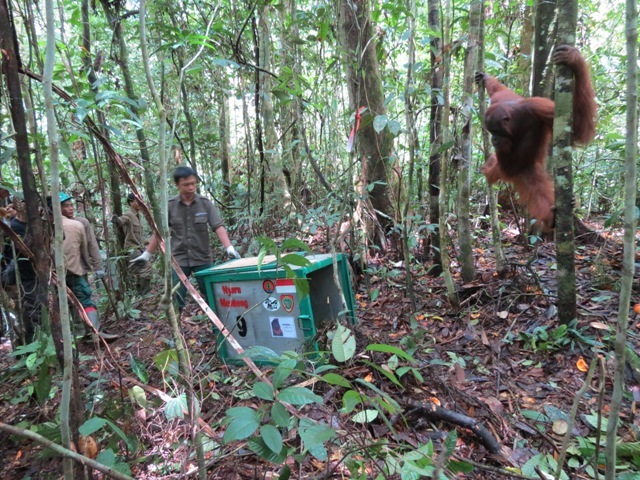 The final day of the fifth Nyaru Menteng orangutan release event had finally arrived! The sky was bright and sunny, and the release team at Camp Totat Jalu in Bukit Batikap were excited to welcome Mexa, Alibaba, Danur, and James to the forest. The helicopter carrying our last group of orangutans left IMK early and arrived safely in Batikap at 9.20 am. Our technicians and release team were standing by and immediately prepared the travel cages to be transported to the release point on the banks of the Teneng River, 35 minutes by ces (a smaller version of kelotok or traditional Dayak longboat) from the camp. 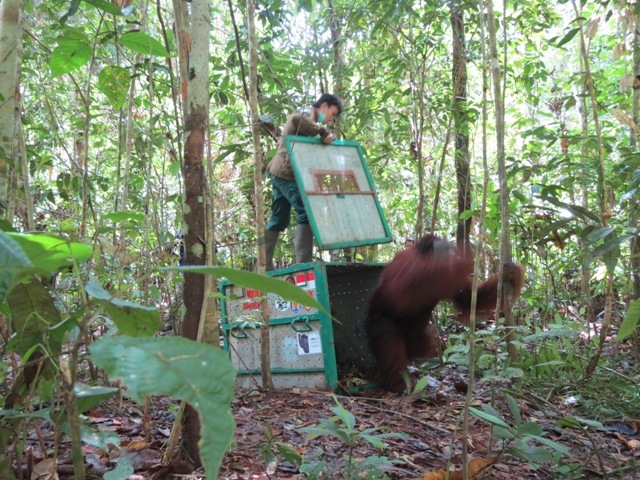 These orangutans were among the heaviest within this release event, so we were fortunate to have a good weather. The bare earth paths were not as slippery as the day before and the river tides were not as strong either. The trip to the release point went smoothly, until one ces carrying two cages experienced some technical difficulties meaning we had to temporarily stop at a bank of a river to transfer those cages to another ces. The trip then continued safely. Fortunately the team had a plan B in place in case of difficulties such as this! Mexa was the first to be released and her cage was opened by Tedison, one of our experienced technicians. 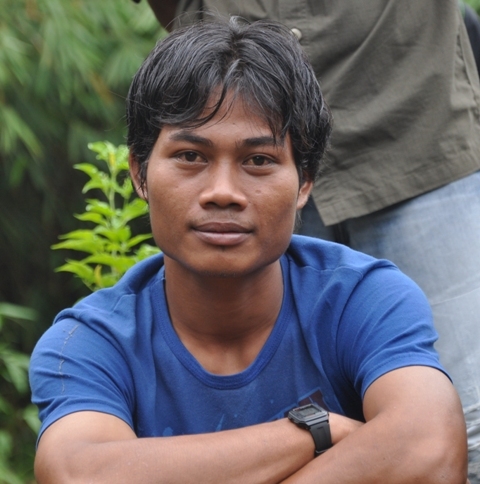 The next in line was Alibaba whose door was opened by Tuwe, Danur by Widodo, and James who was released by Priadi on the other side of Teneng River. When the door was opened to Danur’s cage, Danur stepped out but didn’t immediately climb a tree, instead he went back to the travel cage, and decided to finish the leftover fruit earlier placed there for the journey. After a while, he started climbing a tree and swung away from release point. Not long after, Alibaba approached him and the two male orangutans had a brief altercation but no one was hurt and they went separate ways after. 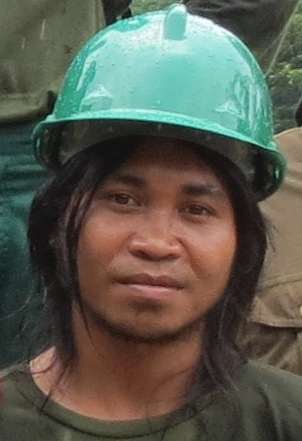 The monitoring team also recorded Danur crossing the river through the forest canopy that connected both sides of the river. He stayed on that side of the river and made his nest at 4 pm. That day, Mexa, Alibaba, Danur, and James enjoyed their first night sleeping in their true home. It was a glorious moment when we called it a day closing the fifth release. 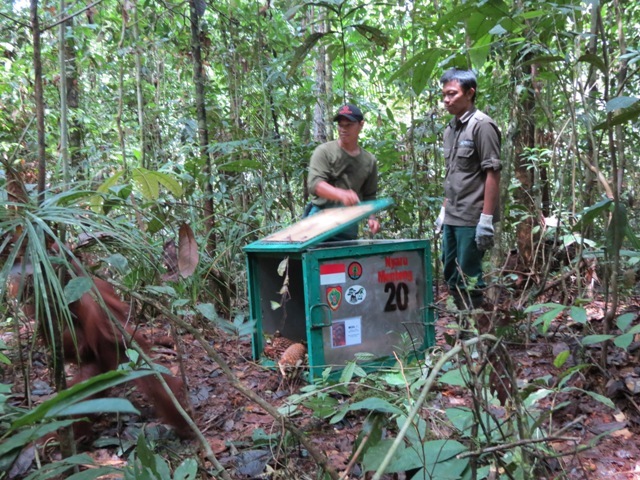 Another 20 orangutans have been successfully released to their natural habitat. It was also a bittersweet moment, we all felt sadness for parting with our friends but joy and happiness for their homecoming, so they can live naturally in their habitat. We would like to thank everyone in the release team, the government, the media, and the donors for supporting and working together in order to help these orangutans back to their true home. However, this is not over yet. We now need your support to continue to reintroduce hundreds more of orangutans at our rehabilitation and reintroduction centers to their natural habitat. Below are notes from some of the technicians at Camp Totat Jalu about their experience opening the travel cage doors and release the orangutans into the wild. First of all, I’d like to thank everyone who has trusted me to open a transport cage door on this fifth release. I was given the chance to release Centil and Ross. At first I was afraid because this is my first time being a release team member, so this is also my first time ever to release orangutan. I finally braved the moment to release Centil and Ross. I feel very happy. This release is a special experience for me. I hope this release will be successful until the end and all of us can be proud; The BOS Foundation, local community, and especially we at Totat Jalu Camp. I am very proud and happy to receive the responsibility from the BOS Foundation to open an orangutan transport cage on this fifth release. I had the chance to release Lupita. I felt comfortable, I wasn’t afraid nor had any doubt because I knew Lupita was not aggressive and would not attack me and the team. I sincerely hope that the next release can be conducted soon. On February 14 2013, the BOS Foundation Orangutan Reintroduction Program at Nyaru Menteng conducted its fifth orangutan release in Bukit Batikap Conservation Forest. During this event, I was given the honor to release a male orangutan named Klowor who was 11 years old. 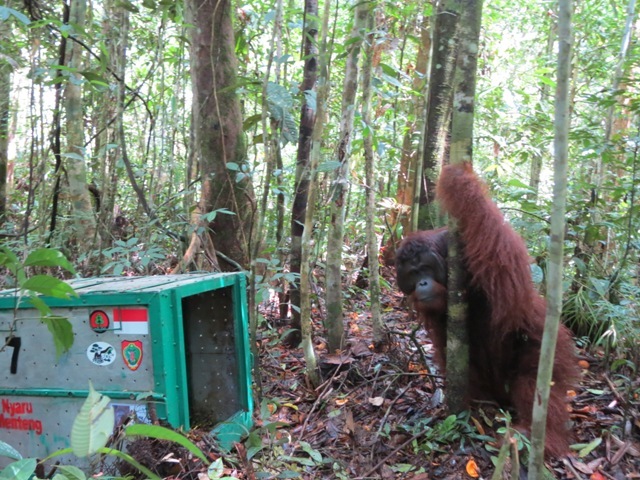 Klowor was released at an area not too far from the helipad behind Camp Totat Jalu with Darsi, Edwan, and Rachmad. I was very happy to have the chance to open the door for Klowor after working in orangutan conservation world for quite some time. This was my second chance to open a travel cage door in my four years working with the BOS Foundation. My first experience was to release Gundul on the fourth release back in November. 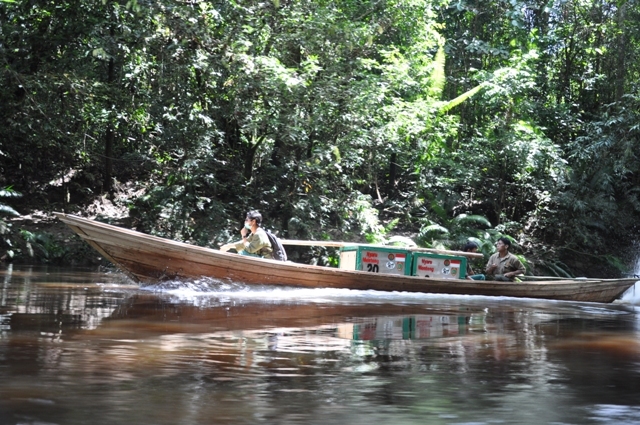 Gundul was released in Karangan Monnu, Joloi River, Bukit Batikap. Based on monitoring results, Gundul is now living well and healthy and I am very happy for her. The feeling was the same this second time around. I hope Klowor will survive just like Gundul. It is an unforgettable feeling to witness orangutans from reintroduction and rehabilitation center can finally live free in their habitat. When I opened the door for Klowor, he looked very happy to be free in his true home. He climbed a tree even though he was still recovering from sedative effects. It was indescribable to see him happy and free, as if he was freed out of jail. I hope I will meet Klowor again during monitoring. 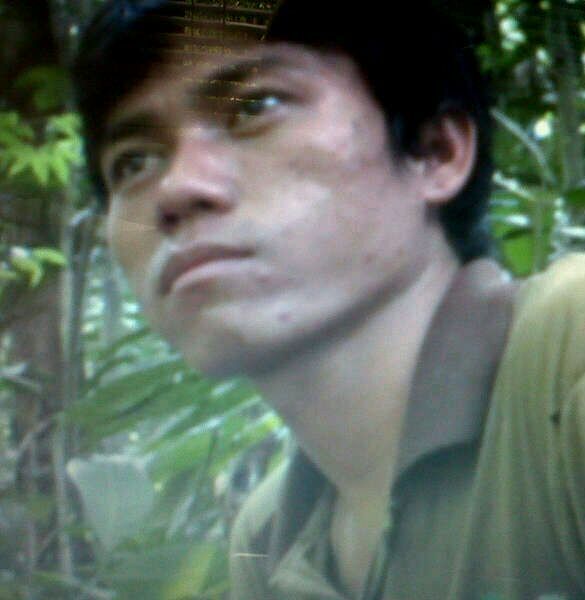 I also hope Klowor can live healthy and happily in Bukit Batikap as his home, forever. I also hope to experience this again on the next releases. AMEN.